New time trial bike uses unique frame design where not all tube shapes are as thin as possible. 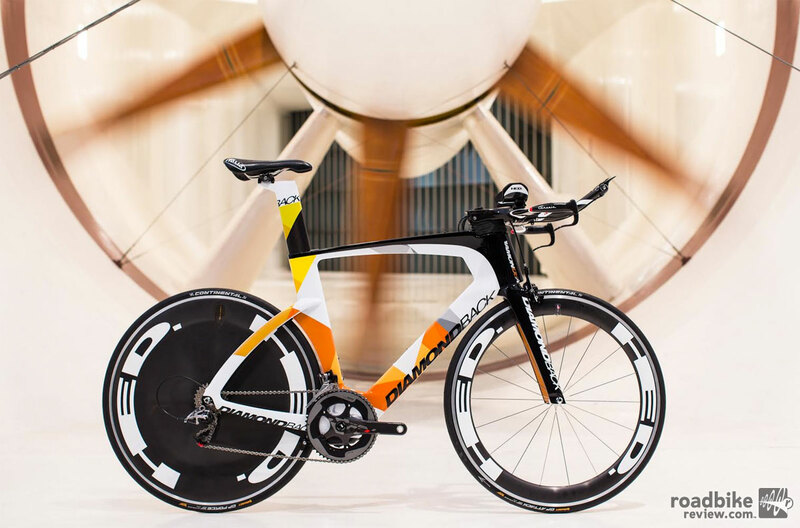 Just in time for next week’s Ironman World Championship, Diamondback has rolled out a new time trial bike. The Serios eschews conventional TT frame design philosophy, which holds that thinner equates to better aerodynamic efficiency. But Diamondback claims that through wind tunnel testing it discovered that the theory did not always hold true. It used numerous shape options for the fork, head tube, down tube, seat tube, chain and seat stays. And after testing the aerodynamic properties of each individual piece, Diamondback claims that adding size to some of the shapes in the correct location led to better aero performance of the Serios in the wind tunnel. At +15 degrees yaw, the Washington state based bike maker says its new steed is up to 33 percent faster than two key competitors. To illustrate this, Diamondback published wind tunnel data that also included the Trek Speed Concept (green line) and Cervélo P5 (yellow line), both long time category leaders. The graph seen below shows that the Serios (red line) is reasonably competitive throughout, but is slightly less efficient when wind is head on or +/- 5 degrees yaw. 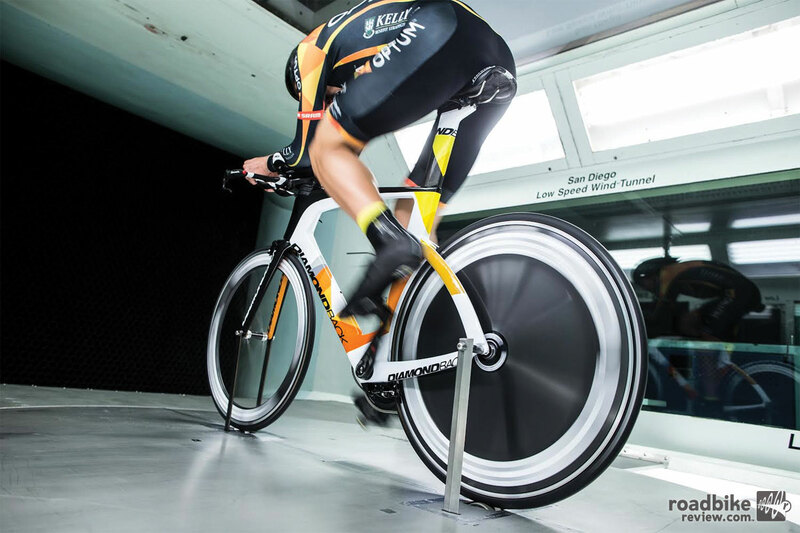 Wind tunnel data shows that the new bike is fairly competitive with the likes of Trek’s Speed Concept and the Cervelo P5. The Serios will be offered in three complete bike builds ($3,000-$8,000) and as a frameset (fork, headset, brakes, HED Corsair handlebar, stem and seatpost for $4,000). The top end $8,000 Serios AF is spec’d with a Shimano Dura-Ace drivetrain, HED Jet 6 plus front and HED Jet 9 Plus rear wheels, HED Corsair handlebar, and HED Corsair integrated brake levers. The $3,000 entry-level Serios S model uses the same frame, but with non-integrated stem/bar combo and lower end wheels. 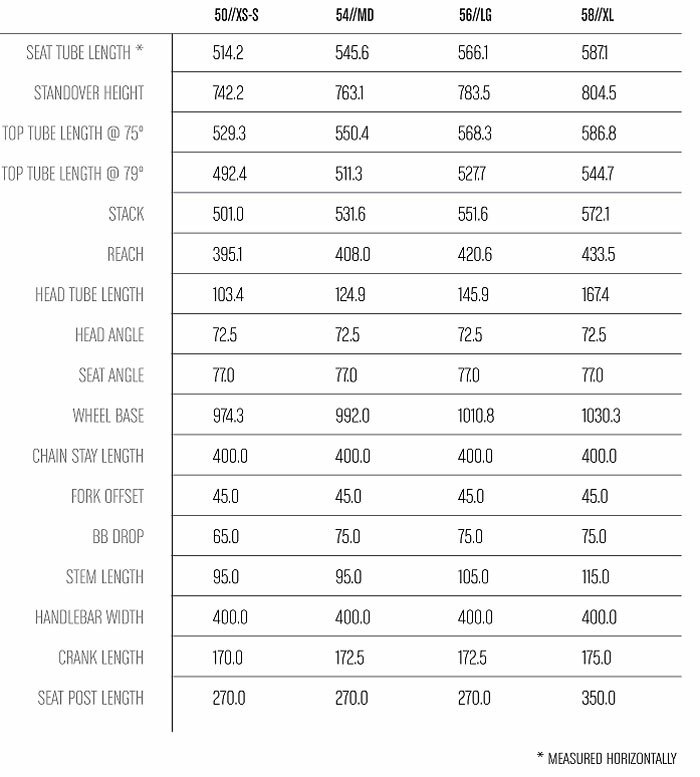 Here’s the full geometry chart for the new bike. The Washington-based bike maker is hoping its new rig will compete with the industry’s leading TT brands. New time trial bike uses unique frame design where not all shapes are as thin as possible. So, did it hold water?